Almost a mini resort of it's own! Nissi Bay is an area at the western edge of Ayia Napa. 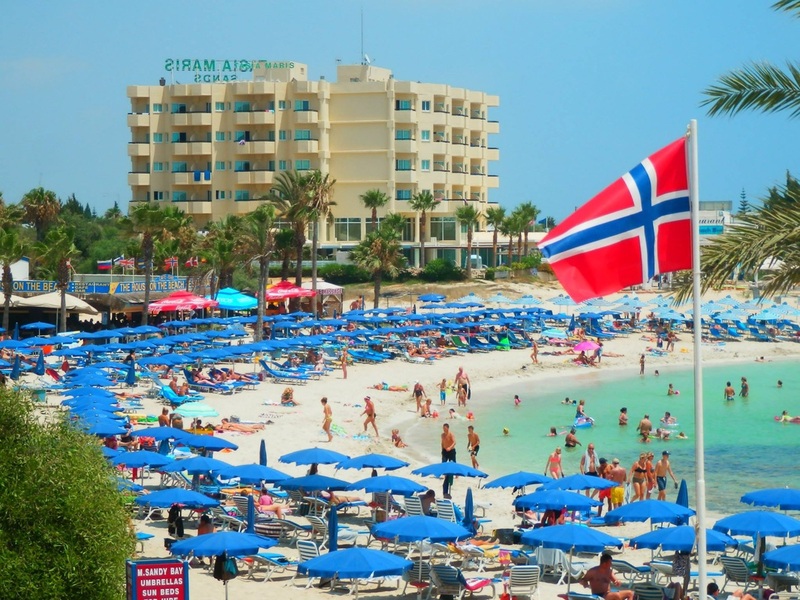 Many holiday companies are selling it as a separate resort these days but it is actually part of Ayia Napa although a couple of miles away from the town centre. 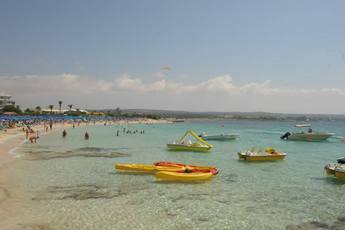 Nissi Bay is where you'll find most of Ayia Napa's best beaches. 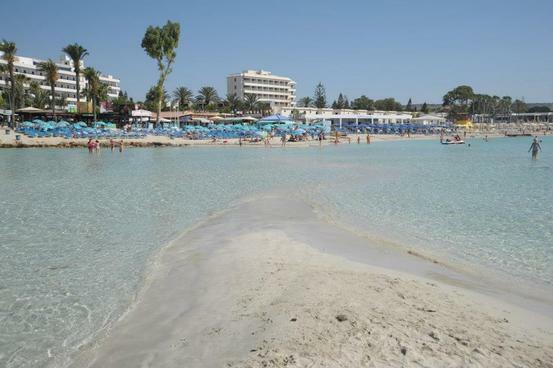 You'll find Macronissos Beach, Landa Beach, Nissi Beach and Sandy Bay. All have gently shelving soft sand and safe swimming waters. They all also have a selection of beach bars, restaurants and waterports facilities. You may have heard of the famous Nissi Bay Beach Bar which is located at one end of Nissi Beach. This is where all the daytime beach parties and foam parties happen but it's only on one part of the beach so if you're not a party animal you can still enjoy Nissi Beach although all the beaches do get very busy in high season. Threading it's way through the area is Nissi Avenue which heads right into the centre of Ayia Napa. Along this road you will find a good selection of restaurants and bars which are family friendly. Many have children's play areas and some have nightly entertainment in the form of tribute acts and other shows. You'll also find supermarkets and souvenir shops. As you pass Nissi Beach, the places to go start to thin out until you reach Landa/Macronissos beaches where you will find one or two bars and a couple of supermarkets. This area is great for quiet, relaxing holidays or if you are holidaying with children. The majority of the accommodation in this area is hotel based rather than self catering with several very high standard and boutique hotels to choose from. Nissi Bay is also one of Cyprus's most popular wedding destinations with ceremonies held at several of the hotels, churches and restaurants in this area. As you reach Macronissos Beach you will find Makronissos Beach Club where huge events are held with huge international acts performing throughout the summer. 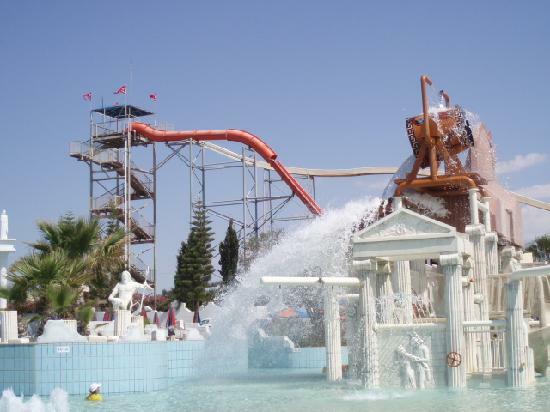 You will also come to Waterworld Waterpark and then Ayia Thekla where there is a small beach and weekly market. 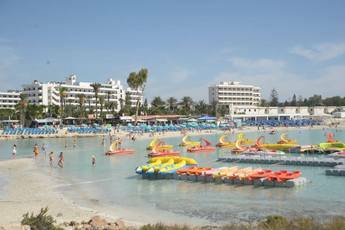 The waterpark is also the start of the bus route which runs along Nissi Avenue into the town centre and then on to Cape Greco, Protaras and Paralimni Village.